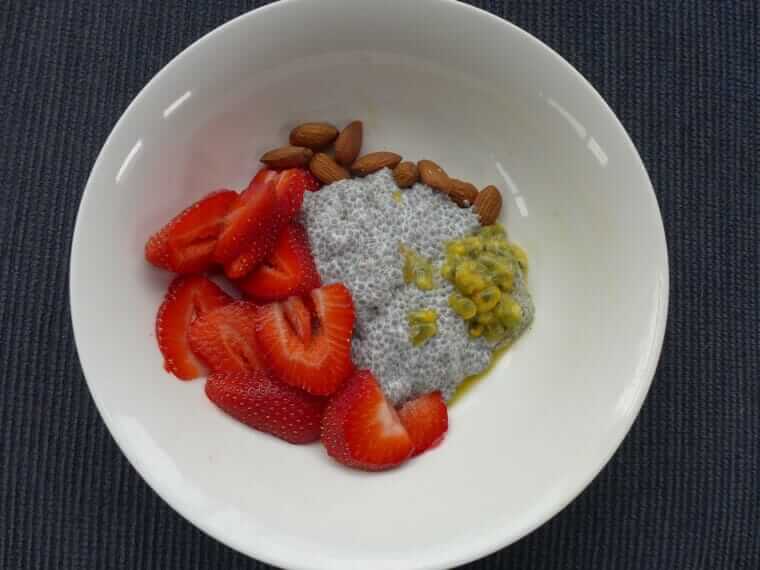 OK, chia pudding is so not me. It reeks of hipness and health food, it sounds incredibly worthy and I’ve shunned it for years. To be honest it doesn’t look that appealing either. But after a lifetime of being overweight, and after piling on 10 kilos during chemotherapy last year due to steroid assisted gluttony, I’ve finally decided to REALLY do something about my weight. They say that the diet that works for you is the one you can stick to. I may have finally found what works for me. It is low carb, healthy fat eating. I’ve lost 5kg in the last 6 weeks and I am not finding it difficult at all. To get this in perspective I am a bread, potato and pasta person and these are off the menu along with many fruits. I thought it would be impossible for me. I’ve always subscribed to the idea that losing weight was all about calories in calories out. And while this is ultimately true, classic dieting sticks to foods that really aren’t filling and leave me hungry, dooming me to repeated failure. I was inspired by my friends who have lost 40 and 50kg each on a low carb healthy fat diet. They are not vegans, but I was impressed enough to give it a go. They are doing a full on ketogenic version of the diet with less than 20 grams of carbohydrate a day. I tried this for a week and it nearly killed me. But technically a low carb diet is anything less than 100g per day so I eased up a bit. I normally eat in excess of 200 grams. I have finally settled at around 50 or 60 grams per day and I am feeling fine. The trick is to replace the carbs with good quality fats. Fat gives a greater and longer lasting feeling of fullness. I am not hungry at all. Avocados, olive oil, coconut milk and nuts are on the menu. I was a bit tired of avocado on low carb bread (Herman Brot, delicious, a lot like Burgen but vegan), so I decided to branch out with a chia pudding recipe from my friends. They made theirs with almond milk, I made mine with coconut milk, but any non dairy milk would work fine. To my surprise it is just like the tapioca pudding I love, but not carby and also high in protein so nobody needs to worry about whether you will perish from lack of protein. 🙂 It is also gluten free for my coeliac friends. I topped it with almonds, strawberries and passion fruit. I promise not to go all low carb evangelical on you. Food for me is all about deliciousness and I will continue to be doing that. Combine the ingredients and let sit for a few minutes. Give it another stir to break up any lumps and put in the fridge overnight.